This is the Cave Building on Hornby Street in 1935. Not to be confused with the Cave Supper Club which was located a block away, this building got its name from its developer. Edward Cave-Browne-Cave, who was the manager of BC Assay and Chemical Supply Co. (a mining outfitter). The Building permit was issued in 1912, and the architects were H L Stevens & Co. Edward was part of the British aristocracy; the first Baronet was Thomas Cave, a Royalist who fought in the English Civil War and appointed in 1641. Edward was born in Malvern, in 1879, the son of the Reverend Ambrose Cave-Browne-Cave. He moved to Canada in 1886, and arrived in Vancouver in 1901, moving to a house on the corner of Davie and Cardero where he lived with his wife Rachel for nearly thirty years. His business interests included President of the Glacier Creek Mining Co, and he was also President of the Vancouver Lawn Tennis Club. (Another Edward Cave-Browne-Cave moved with his musical family to New Westminster in 1911, but while undoubtedly related, they are a different branch of the family). BC Assay continued in business in the building through the 1920s, with Clement Cave-Browne-Cave becoming sales manager. (He was undoubtedly a relative, possibly born in Winnipeg, but not, we think, Edward’s son). In the 1930s he became manager, simplified his name to Cave (at least in the street directory) and the company became Cave & Company. Today, the spot where the building stood is the lane between the 1995 YWCA Downtown building, and the 1999 Le Soleil Hotel. This 1930s postcard shows several buildings that have been redeveloped, and three that are still standing. The extraordinary Marine Building dominates the older picture – one of Vancouver’s rare ‘street end blockers’ – and fortunately, a worthy example, designed by Vancouver’s McCartner Nairne and Partners, designing their first skyscraper. While it’s Vancouver’s finest art deco building, it was far from a positive example of development budgeting. Costing $2.3 million, it was $1.1 million over budget, and guaranteed the bankruptcy of its developers, Toronto-based G A Stimson and Co.
Stimsons were also owners of the Merchant’s Exchange, the building closest to the camera on the north (right) side of the street. That was designed by Townley & Matheson, and the building permit says it cost $100,000 and was developed in 1923 for “A. Melville Dollar Co”. Alexander Melville Dollar was from Bracebridge, Ontario, but moved to Vancouver as the Canadian Director of the Robert Dollar Company. Robert Dollar was a Scotsman who managed a world-wide shipping line from his home in San Francisco. His son Harold was based in Shanghai, overseeing the Chinese end of the Oriental trade, another son, Stanley managed the Admiral Oriental Line, and the third son, A Melville Dollar looked after the Canadian interests, including property development. (The Melville Dollar was a steamship, owned by the Dollar Steamship Company, which ran between Vancouver and Vladivostok in the early 1920s). The larger building on the right is the Metropolitan Building, designed by John S Helyer and Son, who previously designed the Dominion Building. Beyond it is the Vancouver Club, built in 1914 and designed by Sharp and Thompson. On the south side of the street in the distance is the Credit Foncier building, designed in Montreal by Barrot, Blackadder and Webster, and in Vancouver by the local office of the US-based H L Stevens and Co. Almost next door was the Ceperley Rounfell building, whose façade is still standing today, built in 1921 at a cost of $50,000, designed by Sharp & Thompson. Next door was the Fairmont Hotel, that started life as the Hamilton House, developed by Frank Hamilton, and designed by C B McLean, which around the time of the postcard became the Invermay Hotel. The two storey building on the corner of Howe was built in 1927 for Macaulay, Nicolls & Maitland, designed by Sharp and Thompson. Before the building in the picture it was a single storey structure developed by Col. T H Tracey in the early 1900s. There were a variety of motoring businesses based here, including a tire store on the corner and Vancouver Motor & Cycle Co a couple of doors down (next to Ladner Auto Service, run by H N Clement). The building was owned at the time by the Sun Life Insurance Co. Today there are two red brick modest office buildings, one from 1975 and the other developed in 1981. This was one of three Opera Houses in early Vancouver – if you include Hart’s house, which only had canvas walls. The CP Railway built the fanciest a long way from the city’s residents in the heart of their Granville Street territory, next to their hotel, opening in 1891. The Imperial pre-dated it by at least two years and was much located closer to the original city, which started life along Water Street as the Granville township, and spread out from there. The Imperial only lasted in business for about five years; Major Matthews, the city’s Archivist recorded that “in 1898 the Imperial Opera House was still in use, but as a Drill Hall.” This image shows the building already in use as the Drill Hall – although the major recorded the use as ‘Drill Shed’. The Imperial had closed in 1894, leaving the CPR building for a while as the sole attraction. The Imperial opened in May 1889, only three years after the city was newly named and rebuilt after the fire destroyed almost every building. It was initially owned by Crickmay and Robson, who had arrived in 1888, and were both engineers, in partnership in business. They undoubtedly designed it themselves; William Crickmay sometimes described himself as an architect as well as engineer. John Robson returned to England in 1890, but William Crickmay, at the age of about 60, continued to run his engineering business while trying to run the Opera House. While operatic offerings were few and far between, the theatre was initially the only substantial structure to offer plays, visiting performers, the Athletic Club, a skating rink and local events including the Caledonian Society’s ‘Concert, Ball and Celebration’. In August 1889 C Norris appeared with his ’30 educated dogs’. In 1890 The Lacrosse Minstrels performed, John Robson, (not the same John Robson who had built it – this one was Premier of British Columbia) gave a speech, and Miss Agnes Knox, renowned Canadian elocutionist a dramatic recital. A year later the CP’s larger and superior Opera House opened, and bookings at the Imperial slumped. Uncle Tom’s Cabin was performed by the New Orleans Company, and Miss Olof Krarer “The Little Esquimaux Lady” gave a performance with stories of “Life in the Frozen North”. Miss Krarer, a dwarf, described herself as coming from the remnant of a small tribe of blue-eyed blond people called the Angmagsalik from the east coast of Greenland. Clothed in her “native costume” of a polar bear skin parka, she spoke about her people and their customs and sang native songs. Her face was “peculiar, and almost impossible to portray” and her arms bowed, which she claimed was due to her people’s custom of keeping their arms folded at all times to ward off cold. All people of her race, she stated, were of similar height and build. The Esquimaux, she explained, lived without laws or government, the only distinction being that between rich and poor: the rich were those who had flint to strike fires, and the poor were those who did not. Nearly all the information she gave in the 2,500 lectures she gave in North America was made up, uninformed, and just plain wrong, but no one at the time disputed her facts. Mr. Crickmay hoped his salvation might come with the creation of the Imperial Stock Company, formed in conjunction with John E Rice of the Belmour-Gray Company, the first attempt at establishing a BC touring circuit. John F Cordray of Seattle was involved, and soon after the refurbished Philharmonic Hall in Victoria joined in . Plays were performed across a number of different venues, carrying the scenery and props with them. Audiences were unpredicatable, and often performances were better attended in small towns than in the bigger cities. A smallpox outbreak in 1892 in Victoria put the circuit out of business. That year ‘Handsome’ Jim Corbett (later ‘Gentleman’ Jim) fought an exhibition bout in the Opera House, but business was thin. It was closed in 1894 and a year later the Imperial was leased by the Provincial Government as a Drill Hall. William Crickmay died on December 24 1900. His sons, Alfred and Fred continued in business in the city as Crickmay Bros; warehousemen and customs brokers. The building was replaced in 1911 by the Duncan Building, developed by Howard J Duncan and designed by H L Stevens and renamed in 1925 as the Shelly Building when it was acquired by Cora Shelly. One of the many features of the six storey reinforced concrete stores and rooms building, being erected on Seymour street near the corner of Robson for Mr. J. W. MacFarland at a cost of $95,000 is that the stores to be situated on the ground floor and in the basement of the building will contain no posts. The upper floors will be supported by the walls and crosswise beams. Pressed brick, buff in colour and terra cotta of the same shade will be used for facing the building. Hollow tile will be used for the partitions and cement for the floors. The structure will occupy a lot 50 feet by 120 feet. There are 130 rooms in the building all of which will be fitted up in the most up-to-date manner, including hot and cold water, telephone and steam heat. Another convenience will be gas connected to each room, that light house-keeping may be carried on. To make the building completely fireproof, metal window frames and wire mesh glass will be used in the side and rear windows. An elevator will be installed in the building. Messrs. H. L. Stevens designed the structure and are erecting it. The building will be complete and ready for occupancy by February 1. J W McFarland was a city pioneer. He was born in Niagara, Ontario, learned the trade of railway construction building the Hoosac Tunnel in Massachusetts (funded by New York’s ‘Boss’ Tweed), then built railways in both Canada and the US before moving to British Columbia in 1884. He was construction manager for H F Keefer for the Kamloops to Shuswap Lake section of the CPR and in 1885 the Esquimalt Nanaimo Railway at Shawnigan Lake. In 1886 he came to Vancouver and managed the Water Works for George A Keefer, and then the secretary of David Oppenheimer’s Electric Illuminating Company. He was also secretary of the company that built the first wharf, at the foot of Carrall Street – although CPR disputed their right to build it, and after it burned down in an accident the railway took it over. In 1894 he was a founding partner in Mahon McFarland and Mahon, involved in real estate and insurance, until he retired in 1911 and the London & British North America Co took over the company’s interests. Once he ‘retired’ he managed his own portfolio of investments – and the hotel seems to have been his most significant development. 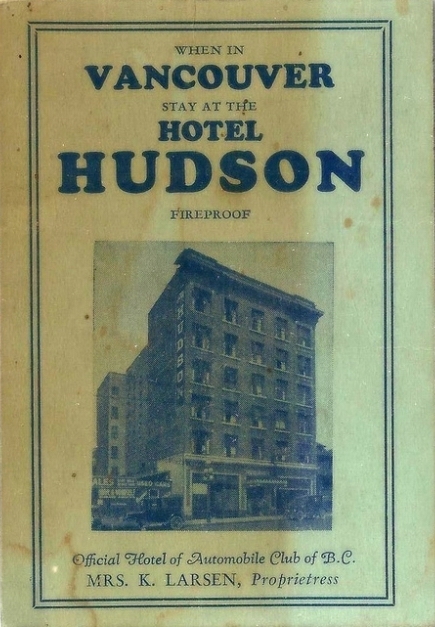 After it was built the property soon changed management style from furnished rooms to hotel – from 1915 to 1928, it was the Hotel Hudson, and then for the next decade the Hudson Hotel. It had a number of resident tenants as well as visitors in the early years. Glen Moffard has this image on his flickr photostream. The Wrigley’s Street Directories for 1927 and 1928 say Mrs Karin Larsen was proprietor of the Hotel Hudson (but entries in the street directory call it the Hudson Hotel). We found only one permanent resident listed in 1927; R J Snow, secretary of the Grolier Society, (for book lovers & graphic arts afficianados). There was a Cigar Stand in the hotel, run by Arthur W W Forbes, and a beer parlour. The hotel manager was James B Keith. In 1929 Mrs. Larsen was still in charge, and still living in the hotel. We assume it was refurbished in 1932, as the Archives have a record of it reopening that year, still owned by J W McFarland, and now identified as the hotel proprietor. From 1938 it was known as the Ambassador Hotel (and the Hotel Ambassador as well), and here’s a Vancouver Public Library image from 1939 that shows men and women sharing the same lounge to drink beer. It was run by G Anderson and A Harrison that year, and the hotel was advertised as Absolutely Fireproof. 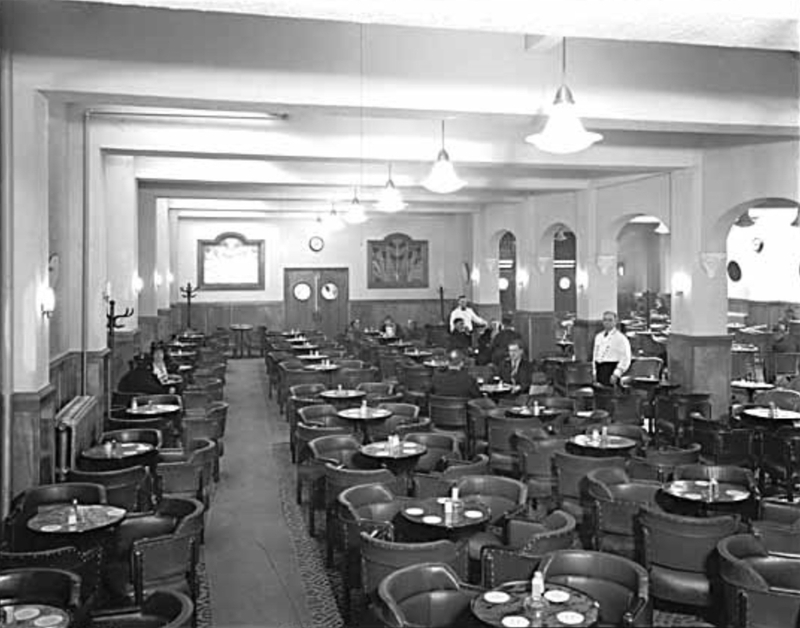 The parlour would be altered during the Second World War as bars were required to erect partitions to prevent contact between unattached men and unescorted women. This was all in aid of the War Effort – to prevent the spread of Venereal Disease (which was apparently entirely due to the behavior of the unescorted women). The hotel only lasted a few more years after this. In 1989 Vancouver House, a 16 storey office building designed by Hamilton Doyle with Musson Cattell Mackey was completed here, replacing the Orillia and the Ambassador. Here’s an image of the north side of West Pender looking west from Abbott in 1981. The biggest change is the addition of Pendera, a non-market housing project designed by Davidson & Yuen and built in 1989. We saw it when we looked at the history of the building that has been replaced since. 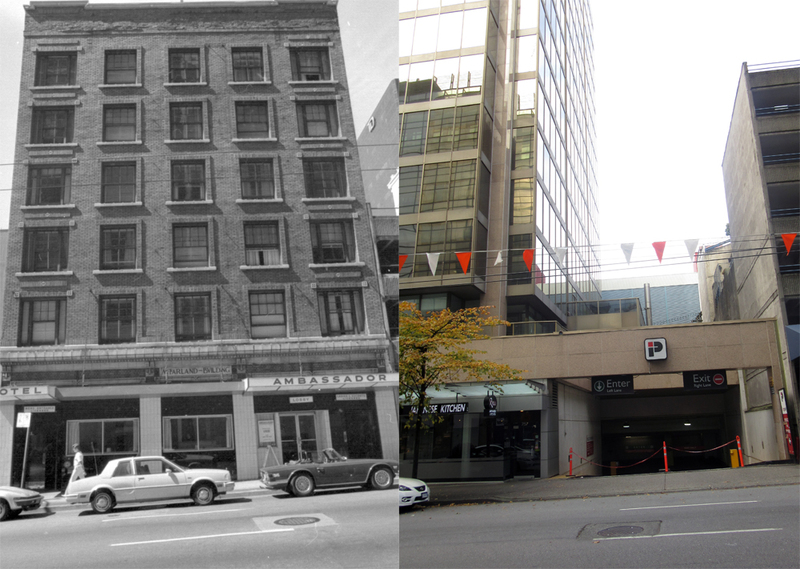 That’s the building used by The News Advertiser and then The Vancouver Sun at 137 West Pender. Closer to us is the Duncan Building which the Statement of Significance for its heritage value says was ‘first-class, modern and fireproof when it first opened, with retail stores on the ground floor.’ They attribute the design to H L Stevens, a Vancouver architect. As with many heritage statements, this was somewhat incorrect. H L Stevens were based in New York, although they had offices in Chicago and San Francisco, and briefly in Vancouver. Howard J Duncan, who developed the building, was a lawyer (he represented the Japanese business community when Mackenzie King investigated the 1907 riot), and he entered a frantic market with unfortunate consequences. With a collapse in demand due to a recession in 1913 the building ended up in foreclosure and was bought by The London & British North America Company Ltd., a real estate and financial firm, in 1916. It was renamed as The Shelly Building when it was bought in 1925 by Cora Shelly. Her husband, William Curtis Shelly was an entrepreneur and philanthropist, who the Heritage Statement credits with founding many businesses, including Home Oil, Pioneer Timber, Canada Grain Export, Nanaimo Sawmills, Canadian Bakeries, and Shelly Bakeries. He was a Vancouver City alderman and Park Board chairman, playing an important role in the development of the City’s beaches. He also served as Minister of Finance in the Tolmie provincial government in the late 1920s and 1930s. On the corner is the Lotus Hotel – unusual for bearing the same name that it was originally given back in 1912. It was designed by A J Bird in 1912 and built by R McLean and Son for Thomas Matthews at a cost of $95,000. He was an Irishman who moved to Ontario initially and then to BC in 1884. He settled first in Victoria, arriving in Vancouver a month before the city burned to the ground. He worked as a tailor/clerk in a clothing store, but invested successfully in real estate. The Lotus was a joint venture with Loo Gee Wing who often worked with a white partner to avoid hostility to his business interests outside Chinatown (which were extensive). Today the Lotus is an SRO Hotel, recently refurbished, and the Shelly Building is one of several hundred-year old office buildings still in demand in the city’s Downtown.